What is asbestos? And how can you determine if you or those you love are in danger of exposure to this harmful substance? A naturally occurring fibrous mineral with an ability to be woven, a resistance to heat and most chemicals, and a capability of withstanding high levels of tension, asbestos has found its way into many common manufactured goods. Some of these goods include ceiling tiles, flooring tiles, roofing shingles, and various types of automobile parts. Exposure to asbestos increases your risk of developing lung disease, as breathing in airborne asbestos causes asbestos fibers to embed in lung tissue. Asbestosis. Asbestosis is a long-term, progressive non-cancer of the lungs caused by inhaling asbestos fibers. Symptoms include shortness of breath and a crackling sound in the lungs while inhaling. Lung Cancer. Lung cancer leads to the largest number of deaths involving exposure to asbestos. Symptoms include persistent chest pain, anemia, coughing, and changes in breathing. Mesothelioma. Mesothelioma is a rare form of cancer found in the thin lining of the lung, chest, abdomen, and heart. Symptoms typically don’t show for many years after the initial exposure to asbestos. Typically, asbestos-containing materials don’t pose threats to health unless they are disrupted or damaged. In the event that asbestos-containing materials become compromised, you should hire professionals to prevent asbestos from spreading. If you’re a homeowner and your project contains any of the described materials above it is highly recommended that you wear a mask and collect a sample to bring to a local lab. In the greater Seattle Area we have used NVL and in the Tacoma area we’ve sent customers to Orion. 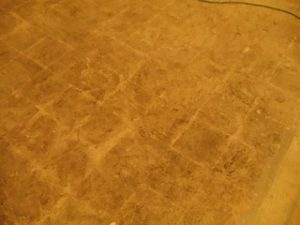 Recently, CSB was called out to do an estimate for blasting a basement and noticed the reside pattern of 9″ tiles. This lead us to question if the basement and house had been exposed to asbestos since the tiles had all been chiseled out by the homeowner’s husband. The wife and our estimator collected a sample tile and sent the owner to NVL to have it tested. She was in tears as we told her that her husband (who didn’t wear a respirator mask while busting out the old tiles) and their pets could have breathed in the asbestos fibers while the tiles were being removed. She called us back a few hours later and told us that the tiles were asbestos and she was working on getting the entire house cleaned. Crystal Soda Blast really doesn’t like to make our customers cry or worried so please do some homework before any do it yourself project. We are always willing to answer questions or point you in the direction of an expert!